Eastern Grain Marketing LLC’s new 2.4-million-bushel rail and container terminal west of Kankakee, IL ready for startup at the end of September 2013. Aerial photo by Steve Huey, Pekin, IL. As construction began early in 2012 on the new Eastern Grain Marketing LLC rail terminal seven miles west of Kankakee, IL (815-802-2789), the presence of a rock quarry right next door hinted at a challenge early in the construction process. When Grain Journal visited the new terminal in September 2013, crews were putting the finishing touches on the facility. Eastern Grain Marketing was formed in 2011 as a joint venture between GROWMARK and Heritage FS specifically to develop a rail terminal near Kankakee, after GROWMARK commissioned a study from Pro Exporter that suggested that a large supply of grain in the area was insufficiently tapped. The venture selected the site due to access to the Norfolk Southern Railroad and State Highway 17, as well as access to a Nicor natural gas main line and Com Ed electric power. With Heritage already affiliated with GROWMARK, the Bloomington, IL-based company assigned its construction division (309-557-6334) to design and build the terminal. Engineers designed a 2.4-million-bushel steel elevator for maximum flexibility to handle corn and soybeans simulataneously and to load both covered hopper railcars on an 8,000-foot loop track and containers for shipment to a Burlington Northern Santa Fe container yard 25 miles away in Joliet, IL. Cost of the facility is confidential. TCR Systems LLC, Decatur, IL (217-877-5622), served as millwright. VAA, LLC, Plymouth, MN (888-583-3527), performed structural engineering services. Cross Country Construction, Elbow Lake, MN (218-685-6410), erected the steel grain storage tanks. KDJ Sales & Service Inc., Mackinaw, IL (309-359-3611), served as electrical contractor and installed automation systems. Hamann Wagner Excavating Inc., Chebanse, IL (815-790-8248), did excavation work. Greg Lambert Construction, Bourbonnais, IL (815-468-7361), along with Eastern Grain employees, built the container loading equipment. A 90-foot-diameter tank holding 515,000 bushels of soybeans standing 88 feet tall at the eaves and 113 feet at the peak. Similarly equipped to the 105s, this tank includes a 16-cable temperature monitoring system, four 30-hp centrifugal fans, and 10 roof exhausters. A 72-foot-diameter wet tank holding 315,000 bushels of corn. It stands 85-1/2 feet tall at the eave and 105-1/2 feet tall at the peak and is equipped with a 12-cable temperature monitoring system, two 40-hp aeration fans, and seven roof exhausters. In addition, the facility has a 30,000-bushel hopper tank for off-grade grain and a 12,000-bushel screenings tank. Inbound grain trucks utilize a 70- foot Fairbanks pit-type scale adjacent to the facility’s 1-1/2-story office building, which is under the control of a CompuWeigh SmartTruck system. A SmartTruck card reader scans the driver’s RF tag, and the system provides data on the truck and contents to interface with the cooperative’s accounting system. A Gamet Apollo probe takes a sample for grading. A separate Fairbanks outbound scale also is part of the SmartTruck system. Trucks proceed as directed by Smart-Read screens to one of two 1,000-bushel mechanical receiving pits. These pits can feed any of three GSI legs – two 20,000-bph receiving legs equipped with Maxi-Lift 20×8 CC-MAX buckets on a 22-inch Goodyear belt and on a 30,000-bph shipping leg with two rows of 16×8 CC-MAX buckets on a 34-inch belt. The receiving legs deposit grain into a Union Iron/HSI rotary double distributor. From there, grain travels via 40,000-bph GSI enclosed belt conveyors to the 105-foot tanks, 30,000-bph GSI belt to the wet tank, or 20,000-bph GSI drag conveyor to the soybean tank. Wet grain can be sent via wet leg to one of two natural gas-fired Zimmerman 4,700-bph tower dryers. Having two dryers allows for flexibility during slow times at the beginning and end of the harvest season, says Martinek. The storage tanks empty onto aboveground GSI conveyors – 57,000-bph belts from the 105s, a 30,000-bph belt from the 90, and a 20,000-bph drag from the 72 – all running back to the central legs. An overhead 57,000-bph GSI enclosed belt conveyor carries grain overhead to a 50,000-bph CompuWeigh bulk weigh loadout scale under the control of the supplier’s GMS 4000 automation system. 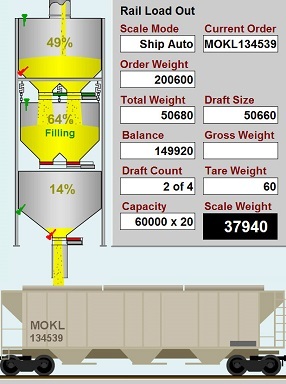 The operator can run grain through an overhead 40,000-bph Intersystems gravity screener prior to loadout. During loadout, workers atop railcars are protected by a 280-foot Fall Protection Systems trolley unit running the length of three railcars. Martinek says he expects that the system will be able to load a 75-car NS unit train in five to six hours. The facility also can load 20-foot containers in a shed adjacent to the bulkweigher equipped with a Batco belt loader.